A smart, sweeping novel–at once satirical and moving–about love, a famous lost painting, and a dark secret from the past, set in the London art world. Annie McDee, thirty-one and recovering from the end of a long-term relationship, is chef for two sinister art dealers. She’s just spent her meager savings on a dusty junk-shop painting for her new, unsuitable, boyfriend. But when he doesn’t show up for his birthday dinner, it becomes hers. And amazingly, the painting speaks–though only we hear “him.” Shrewd, spoiled, charming, world weary, and cynical, he comments, from his unique perspective, on Annie and the modern world, but he also recounts tales of his previous owners: Louis XV, Voltaire, and Catherine the Great, among them. Once it becomes known that Annie has the painting–whose provenance involves the Nazis–she finds herself at the center of a frantic, and sometimes fiendish, scramble among dealers, collectors, and other highly interested parties, for its ownership. It’s a dazzlingly irreverent and entertaining many-layered tale of a devious world where, however improbably, love will triumph. I received a copy of this book via Penguin First to Read. This does not affect my opinion or the content of this review. To be honest I don’t even remember requesting this one. It isn’t in my usual milieu. And I am depressingly late in getting to this. Somehow it slipped from the queue and I only just noted I’d missed it. It seems appropriate that this should pop back up now when I have been pondering literary fiction, because this is indeed categorized as literary fiction, though honestly I might have called it upmarket. In the prologue we are thrown into the rarefied world of high end art auctions. We first meet the impoverished earl who has set the whole thing up and is instructing his employees on how best to drive up the bidding. Then we run through a kaleidoscope of snippets of the people who will do almost anything to obtain this priceless work of art. This actually is the beginning of the end. Jumping back to the start of the story, we then meet Annie in the first chapter, and we meet the painting in the second. It is much odder to have one of your characters be a painting than I’d thought it might be. Poor Annie is miserable in her new life since her unexpected divorce. Dead end job, worse dating prospects, she buys the panting on a whim for her date. The poor painting isn’t any happier where he’s ended up. Kaleidesope though seems to be the name of the game. We keep jumping from one character to the next. Getting to know their fears and their dreams. And it simply immediately clear what their connection is to the story. 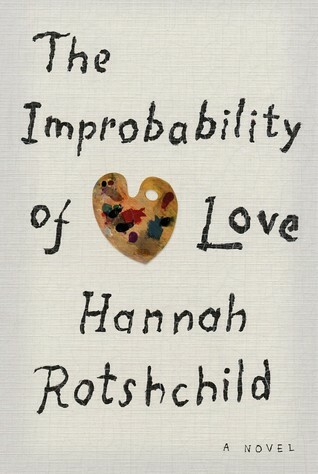 But we always come back to Annie and The Improbability of Love. Frankly I wish we’d stayed with those two characters more. But that is a particular foible of mine. I tend to prefer the relationship aspects of a book when action is not available. This book for the most part hadn’t much in the way of action, and really it didn’t focus on a single relationship. This book is about people and the relationships, known and known. Biggest advice I can give anyone looking at this book (which oddly enough I do recommend) is to slow down and dive in. This author has created such a rich and immersive setting, which much like the kaleidoscope I keep mentioning, is a restrictive setting, but filled with innumerable pieces, and you turn the story this way and it forms one picture, and that way it forms another picture. It is fascinating. So just sit back and let the colors and shapes of their lives flow over you, turn the story this way and that to see what fascinating pictures you can make. The author has left us with a wealth of material to work through. Personally, that is the hardest thing for me. I am inclined to race through books in an attempt to gobble everything greedily tight this minute. But even with my breakneck nature, no matter how I tried to race through, the kaleidoscope would turn and it would force me to stop and take a longer deeper look. Honestly, I’d say this story has very little to do with Annie at all. She one small piece of the kaleidoscope, the mirror system perhaps, but still just one part. She is the simply the reflection upon which everyone else’s story was told. A story of desperation, greed, avarice, and love. But it wasn’t Annie’s story. How’s that for something strange? What is stranger to me is the blurb. Go back up there and read it again. It sincerely sounds like a romance novel blurb. There’s no getting around it. But it is also categorized as literary fiction. It is in fact literary fiction, there’s no getting around that either. So what does that mean? Is this really what the author and/or publisher feels describes the book best? I really don’t think it does and I suspect that it is an attempt to tap the romance reader market. The line between genre fiction and literary fiction (though honestly literary fiction is in itself a genre) is a funny one. And it depends very much on how one defines the disparate elements. Would I have even contemplated reading it with a more accurate blurb? No I probably wouldn’t have. Did I enjoy it? Yes I did. But this isn’t romance, it has a romance happily ever after appended rather clumsily to the end of it, but it isn’t a romance. Would I recommend it to romance readers? That is a more difficult question to answer, I’d say it depends on the reader’s tastes. If I did, I would be sure to carefully note it isn’t a romance, because the one thing most romance readers, whether they also enjoy literary fiction or not, have in common is that they despise being deceived to lied to.